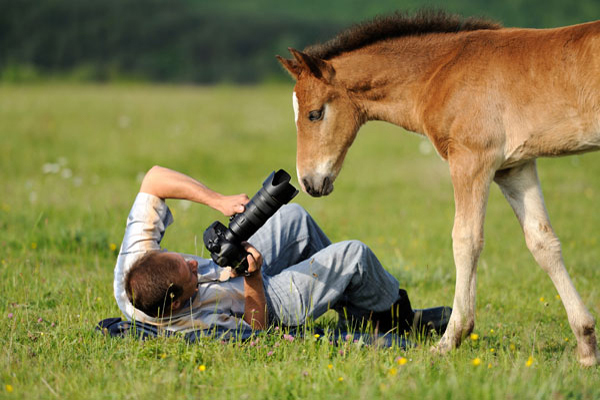 Wildlife photography deals with taking photographs of wildlife, or non-domesticated animals. Here the focus is on nature and wild creatures. Unlike any other genre of photography, Wildlife photography can be most challenging. It's an adventurous career that demands mental as well as physical fitness besides general aptitude for the job. If you're a photographer who is fascinated by animals, nature and enjoy travel, Wildlife/Nature Photography can be an ideal career for you. It can be taken as part of ones hobby as well as a profession. Wildlife photographers shoot photographs of animals and plant life in its most natural and habitual form. Photographing wildlife in their natural habitat provides one the chance of experiencing the sheer thrill and rare excitement of their fascinating world. Wildlife photographers need to spend a great deal of time traveling the world to remote locations for that perfect shot. To take it up as a profession, aspirants of Nature / wildlife photography requires a keen eye, and sense of composition, along with the technical knowledge to use cameras and lenses properly and creatively. They should know how to safely locate and observe wildlife without endangering themselves, the animals, or the environment. Wildlife photographers may work full-time for a publication, on a contract basis for an agency, or as independent freelancers. Some wildlife photographers concentrate on specific environments or animal species, such as birds and insects in tropical climates, or bears, wolves and other species in mountainous settings. One of the essential requirements for a career in wildlife photography like any other photography is excellent technical skill. Moreover a wildlife photographer is required to have a lot of patience and ability to wait for the perfect moment to capture an image. Like any photographer, they should possess additional skills such as good hand-eye coordination, creativity, a keen eye for detail and be familiar with computer software programs needed to edit and process images. They should also have immense passion for wildlife, nature and conservation, along with willingness to work outdoors. Besides they must have good communication & persuasive skills and be persistent. As specialized degree courses for wildlife photography is rare in India, one can enter the field with a Bachelors degree in photography or photojournalism. One can even do a Diploma/Certificate course in Nature and wild life photography OR Wildlife and Travel photography or so. Anyone can take up these courses after completing 10 +2. It would be a good idea to work with an established photographer before starting out on your own. There are seminars, workshops and conferences being held on wildlife photography which one could attend to further ones knowledge. It is very important in this profession to have as many people as possible to like your work. For this Wildlife photographers should focus on building their portfolio and use different online social mediums like Facebook, Flickr etc to showcase and promote their work. Career opportunities are plenty in the private sector besides the option of freelancing. Wildlife photographers are employed by various publications like newspapers and nature or travel and tourism magazines, wildlife NGOs etc. Other option include joining a wildlife channel. Yet another option for wildlife photographers is to work as Photo Journalists. As a wildlife photographer, you also have an opportunity to sell your work to websites, art galleries, publishing companies who might be interested in your work. They could also host exhibitions and enter photography contests. One could use one's photographs to design cards and calendars, can even launch a brand of these. While some others embark on innovative careers like conducting tour operations for wild life enthusiasts, such as birding camps for bird lovers, bear or tiger or mountain species trail tours for animal lovers etc. which will allow them to make money without compromising on their passion. Remuneration of a wildlife photographer is non-predictable. Once you are popular and reputable pay won't be a constraint. Freelancers often earn more than those employed on a payroll, but their earnings depend upon talent, client list and the location in which they work. Institutes that offer courses specific to wildlife photography are few. Those institutes that offer diploma/certificate courses in wildlife photography are Delhi School of Photography, Wildlife Institute Of India, Dehradun and School of Photography: Bharati Vidyapeeth, Pune. To get the list of institutes offering various photography courses click on the course name below.